Simple lines accent a simple, warm, complementary color scheme. If you walked into a room, and the baseboards were missing, you'd notice it right away. As finish trim, baseboards serve an important aesthetic purpose, but that's not all they do. Far from it. 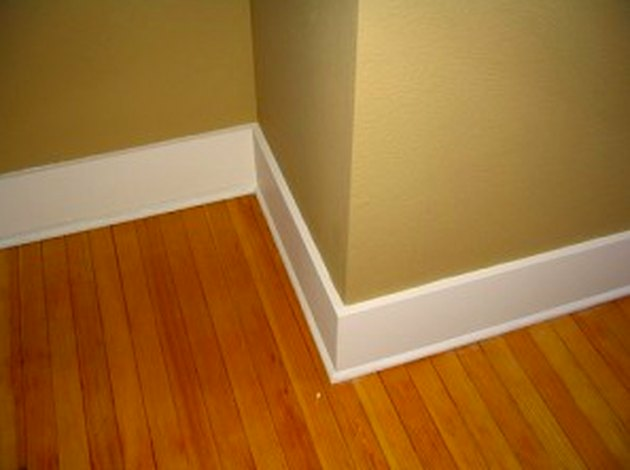 If the floor is hardwood, the baseboards hide the required 1/4-inch expansion gap between the flooring and the wall. They do the same for laminate flooring, and since this flooring usually isn't nailed, it is the baseboards hold it down. Baseboards hide the factory edges of carpeting and tile. Additionally, they prevent drafts from blowing through the gap between the bottom of the wall and the floor. And those are just the practical benefits. When it comes to aesthetics, baseboards play a large part in setting the design tone for the room. The baseboard style should be reconsidered whenever you remodel or paint a room, refinish the floor or install a new floor covering. Decorative baseboards with elaborate profiling cost more per liner foot than simple ones, but they both cost roughly the same to install. The cost variations in materials is considerable, however, so budget is an important consideration when planning a baseboard retrofit. What's Involved With a Baseboard Retrofit? If you're planning to install wider baseboards than the ones you already have, the replacement procedure involves little more than removing the old ones and installing the new ones. However, if you want narrower baseboards, you'll have to plan on patching the part of the wall that gets exposed. This may be as simple as patching a few dents with joint compound and touching up the paint, but it could involve much more than that and thus could be more expensive. Baseboards are typically caulked, and removing all the old caulk from the wall can be troublesome. Installing new baseboards is a straightforward procedure, but it calls for accurate cutting and fitting. When installing ranch-style baseboards, which are those with a plain, straight face profile, an experienced pro can do a great job quickly with a miter saw. If you choose colonial-style baseboards, which are contoured, the installer may have to cut corners with a coping saw to get a clean match. That drives up the cost for two reasons. Coping is a slower, more meticulous process, and the pros that do it well charge a higher rate. Contoured baseboards have to to be fitted with a coping saw. Baseboards are generally priced by the lineal foot, so to estimate the cost of materials, you have to measure the amount of wall/floor space that needs coverage. As an example, a rectangular 10 x 12-foot bedroom needs 44 feet of baseboard, minus the footage occupied by doors. A certain amount of material gets wasted during cutting, so it's common to add a 10 percent overage to the estimate, which brings the total needed close to 50 feet. 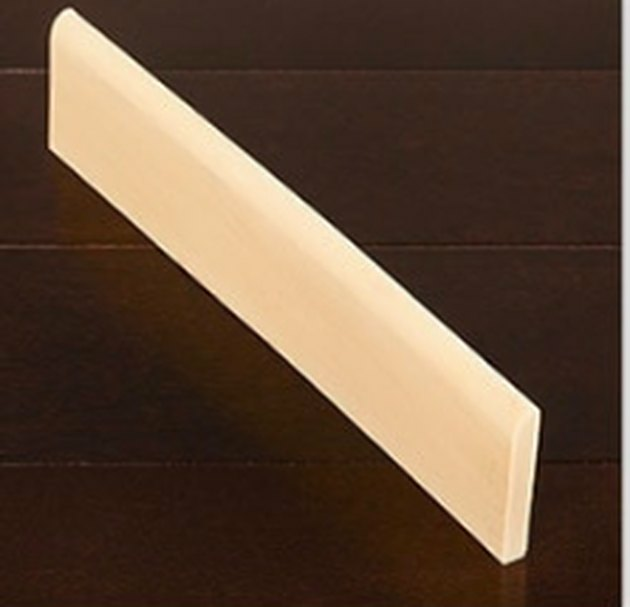 The cost of baseboard varies considerably, from about $0.65/foot for 4-inch, primed, ranch-style MDF baseboard to $20/ft or more per foot for colonial or contoured wood baseboard of various widths. Other material options, such as composites or polyurethane, average from $1 to $3 per lineal foot. A typical house requires several hundred feet of baseboard, so the cost of the material can be a significant factor. For example, if you need 500 feet of baseboard and you choose a simple design made from primed MDF that costs $0.65/ft, you will spend around $360. If you choose an upscale design made from stainable wood, you may spend thousands of dollars for the materials alone, and that's before you pay anyone to install it. Stainable baseboards are more expensive than those made from primed MDF or pine. Trim installers often charge by time, with rates averaging from $35 to $65 per hour. When installing baseboards, however, it's more common to charge by the lineal foot. 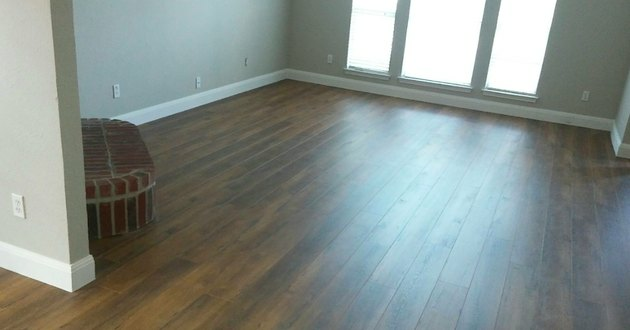 The rate varies depending on whether the installation is part of a larger job, such as a floor replacement, or it's a standalone project. Expect to pay from $1 to $2 per foot for installation in the first case and from $2 to $4 per foot in the second. Paying by the foot is usually a better deal for the homeowner because it avoids cost bumps caused by extra time spent on uneven walls or floors or special circumstances, such as obstacles or the need for an unusual amount of cutting. Painting of pre-primed baseboards usually isn't included in the installation cost, but when high-end baseboards need to be stained, staining is usually included in the price. Removal of old baseboards is an extra job that installers usually bill by the hour, but for some high-end jobs, it may be included as part of the installation. The cost of painting isn't always included with baseboard installation costs. Installers will often give you a quote that includes the cost of the baseboards and the installation. Depending on the quality of the baseboard material and the amount of work involved with installation, the quote could be anywhere from $1.80/ft. to $30/ft. If you live in a house with an average amount of floor space, and you need 500 feet of baseboard, you could receive a quote anywhere between $900 and $15,000, although the high end of this range applies only to the highest-quality baseboards, which are rarely used. A more realistic range of estimates for an average-sized house would be more like $1,000 to $4,000. 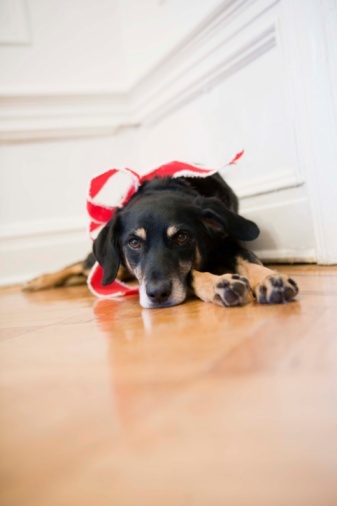 You may have to add the cost of painting the baseboard as an extra. Most installers will caulk it and fill the nail holes, but they'll leave the painting for someone else. That could set you back an extra $1 to $2 per foot. If you're on a budget, you may want to avoid paying that extra money by doing the painting yourself.